Watch the Video Tutorial on Arrays, at the end of this Document. 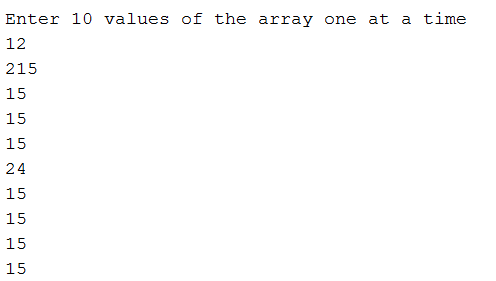 What is meant by an Array ? What is the Need of Arrays in Java ? Instead of creating different variables in order to assign different values, by using arrays we can declare more than one element or value under the same declaration, we can also allot the space for each Array in Java.Therefore, we need not create a sepearate variable for each separate value. In the above Java statements , we can input the value of the variable ‘m’ for 10 times using the for loop as shown , but as soon as the next value of the variable ‘m’ is entered by the user the previous value of the ‘m’ gets deleted , therefore , If we want to calculate the sum of the 10 values entered by the user , it is not very easy , therefore , to perform this activity , we can use Arrays to make it easier and simple to avoid confusion for better programming. In the above statement , we declared ‘m’ as an Array , and we also declared the size of the Array as 10 , therefore , the array ‘m’ can hold 10 different values. EX : int l = m.length //here ‘m’ is the array and l is the length is the array. In the above statement the first  represent the rows of the array and as we placed 2 in between the first  , it means that the array ‘m’ is allocated for 2 rows . The second  represent the columns of the array and as we placed 3 in between the second  , it means that the array ‘m’ is allocated for 3 columns . Firstly , we have declared a 2D array ‘m’ and by using the for loop , we printed the rows and columns of the array in the form of an array. How To Input the elements of the Arrays form the User ? In the above statement we have declared the array ‘m’ , in the method ‘teja’ of the program. 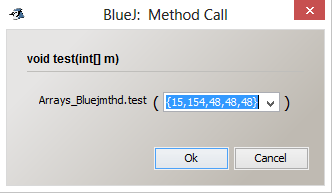 Example Program to input the elements of the array through Input Stream Method,We should follow all the rules that are required to input the values through Input Stream Method. In the above program the highlighted part plays the real role in arranging the elements entered by the user in the array. Searching is a process in which the entered value is checked with the already present values to find out whether the entered value is present in the array. Do check out the video tutorial on Searching, at the end of this topic. Binary search can only be applied to array whose elements are in either or descending order. Step 1, The mid term of the array gets calculated , it will be calculated as (first element + last element)/2 and based on the mid term , the array gets divided into two parts. the search is said to be unsuccessful. Subscribe Us on Youtube for more videos! Sorting is a process in which the elements of the array are either arranged in ascending or descending order. It is the method in which the control starts from 0th position and it checks for the lowest value , and replaces it with the value present at the 0th position of the array , in such a way it replaces the elements which are not in order , and thus results in ascending order. Please do Subscribe to Tech Raj on Youtube, for more Java Tutorials. Thank goodness somebody like you is there!! !